This webpage provides a compilation of on-line instructional resources and teaching activities related to Optical Mineralogy and Petrography. This site is intended for a) students, who desire to review the principles and methods of optical mineralogy and petrography, and b) faculty who seek instructional materials and activities to support their own teaching of these subjects. A Guide to Thin Section Microscopy (Acrobat (PDF) 13.1MB Apr2 12) by Michael M. Raith, Peter Raase, & Jürgen Reinhardt. A comprehensive coverage of optical mineralogy. Published in PDF format (113 pages). Sponsored by the more comprehensive Deutsche Mineralogische Gesellschaft and the Mineralogical Society of America Open Access Publications. Optical Mineralogy in a Nutshell--Use of the Petrographic Microscope in Three Easy Lessons -- Jane Selverstone, University of New Mexico; Powerpoint presentations (unzip the files) with all the essentials! Definitely start here! Guide to Thin Section Microscopy--an excellent open source tutorial by Michael M. Raith, Peter Raase, and Jurgen Reinhardt (2011) 107 pp., available through MSA. Polarized Light Microscope Fundamentals -- Wayne Powell, Brooklyn College CUNY, Introduction to the polarized light microscope, mineral habit, refractive index, color and pleochroism, polarized light, birefringence, extinction angle, estimating mineral modes. Optical Mineralogy -- Greg Finn, Brock University; a complete set of lecture notes for an optical mineralogy class, including useful figures, tables and photomicrographs. Animated PDFs showing Optical Properties of Minerals -- John Brady, Smith College. Download these PDFs demonstrating: Snell's Law (Acrobat (PDF) 156kB Feb11 09), Vector Resolution (Acrobat (PDF) 444kB Feb11 09), Retardation (Acrobat (PDF) 3.4MB Feb11 09), Dispersion (Acrobat (PDF) 2MB Feb11 09), and Becke Lines (Acrobat (PDF) 4.6MB Feb11 09). Uniaxial Positive Indicatrix Movie (more info) and Biaxial Negative Indicatrix Movie (more info) (movies are also available for download from the Indicatrix Movies activity page) -- David Hirsch, Western Washington University; movies showing slices through crystals in different crystallographic orientations, and the corresponding indicatrix and interference colors. These are big files and take awhile to download. Make sure you have a current version of QuickTime to view these. The frame rate is fairly high so you might need to pause the movie and step through with the cursor keys during teaching. Optical Mineralogy -- Mickey Gunter, University of Idaho; a 43 page PDF file of everything Mickey knows (or thinks is important) in the study of optical mineralogy. Identification Tables for Common Minerals in Thin Section -- John Faithful, Hunterian Museum, University of Glasgow; comprehensive and easy to use tables of optical properties of the rock-forming minerals. Minerals Under the Microscope -- Charlotte Gladstone and Paul Browning, University of Bristol; tutorials demonstrating fundamental optical properties. MicroView -- a Java aplet that allows you to see a variety of minerals and rocks in thin section and grain mount by rotating the field of view, and looking at the image in both plane polarized and cross-polarized light. North Dakota State University. Petroglyph -- Eric Christiansen and others, Brigham Young University; a comprehensive tutorial that includes modules on the petrographic microscope, plane polaraized light, cross polarized light, reflected light, consoscopic light, electron microscope, and includes a variety of petrogrpahic tools, query functions, and a quiz mode. Commercially available as a CD. Mineral Property Sheets -- David Hirsch, Western Washington Univ. ; This activity consists of a set of 69 mineral sheets to be used as part of a term-length set of labs. Each sheet has spaces to write physical and optical properties for each mineral as well as a crystal form diagram scanned from Nesse and/or Dana. Experiments in Crystal Optics -- Hans Dieter Zimmermann; The purpose of the experiments below is to impart an intuitive understanding of the interaction between light and crystals and thus, of optical crystallography. This will help to demystify what is seen in the polarizing microscope and will better prepare students for the introduction of optical indicatrices as 3-D models to describe the directional dependence of light velocities, and thus refractive indices in anisotropic crystals. Laboratory Exercises and Demonstrations with the Spindle Stage -- Mickey Gunter, University of Idaho; The goal of this lab session is to introduce you to the spindle stage and its possible uses in an undergraduate mineralogy lab. At the undergraduate level, it can be used to identify minerals and to demonstrate the relationships among grain shape, retardation, and interference figures. 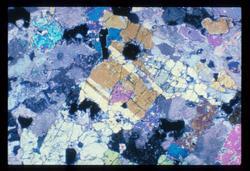 Minerals and Light -- Edward Stoddard, North Carolina State Univ. ; I've always thought that we might attract a major or two if we introduced first-year students to interference colors and such. Therefore, this exercise is primarily intended to be used in an introductory (physical) geology class, perhaps for advanced students or as an extra credit project. It may also be appropriate as a brief introduction ("teaser"?) to optics in a mineralogy or optical class. Growing Crystals on a Microscope Stage -- Paul Sorensen and Dexter Perkins, Univ. North Dakota; Many compounds crystallize rapidly from evaporating solutions, and many can be crystallized from melts. Because of this, it is possible to do simple crystallization experiments and to watch crystals grow over short time periods. Students can study several different compounds during one lab period. Students can examine many things quickly and easily, including crystal habit, growth zones, nucleation, deformation textures. Properties of Minerals and Intro to Polarizing Microscopes -- Dexter Perkins, Univ. North Dakota; This exercise continues the study of the physical properties of minerals and introduces petrographic microscopes. The properties of Amphiboles, Micas, Pyroxenes, and Olivines and an Introduction to Mineral Properties in Thin Section -- Dexter Perkins, Univ. North Dakota; Students look at mafic igneous minerals, learning to distinguish and identify them in hand specimen. They also look at a few of the minerals in thin section. Examination of the Quartz, Feldspathoids, Feldspar, Zeolite Group and other Framework Silicates -- Dexter Perkins, Univ. North Dakota; Students study hand samples of light-colored igneous minerals and related mineral species. Students look at some of the same minerals and others in thin section. 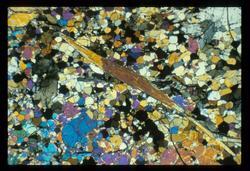 A Last Look at Igneous Minerals in Thin Section -- Dexter Perkins, Univ. North Dakota; A final lab exercise that uses the optical mineralogy skills learned in the previous labs and begins the transition to petrographic analysis of thin sections. Sedimentary and Related Minerals -- Dexter Perkins, Univ. 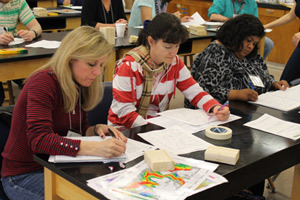 North Dakota; This exercise is an introduction to sedimentary minerals and rocks. Metamorphic Rocks and Minerals -- Dexter Perkins, Univ. 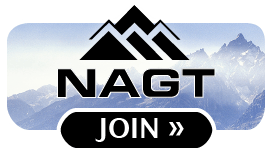 North Dakota; This exercise is an introduction to the most important metamorphic rocks and minerals. Asbestos: Mineralogy, Health Hazards, and Public Policy --Helen Lang and Sid Halsor, West Virginia Univ. and Wilkes Univ. ; In this laboratory exercise students will have an opportunity to examine the crystal structures, optical properties and health hazards of the common asbestos minerals. The laboratory will reinforce optical microscopic skills that students have learned in mineralogy and show them how mineralogy can be critical to understanding a current public policy issue. Fun with Asbestos -- Dexter Perkins, Univ. North Dakota; This exercise is a practical application of optical mineralogy involving identification of some asbestiform minerals. Guided Discovery and Scoring Rubric for Petrographic Analysis of a Thin Section -- David Mogk, Montana State University; A guided discovery approach is used to "unpack" the methods and observations used by "master" petrographers in the petrographic analysis of a thin section. A series of spreadsheets are used to direct students to make appropriate observations to systematically a) identify minerals in thin section, b) describe rock textures to interpret petrogenetic processes and geologic history, and c) apply this information to address questions of geologic significance. The matrix can be used as a scoring rubric to determine the degree to which students have correctly identified minerals in thin section and described and interpreted rock textures. Igneous Textures -- John Winter, Whitman College; powerpoint presentation with figures from Chapter 3 of Winter's Igneous and Metamorphic Petrology textbook. Metamorphic Textures I -- John Winter, Whitman College; powerpoint presentation with figures from Chapter 23 of Winter's Igneous and Metamorphic Petrology textbook. Metamorphic Textures II -- John Winter, Whitman College; powerpoint presentation with figures from Chapter 23 of Winter's Igneous and Metamorphic Petrology textbook. 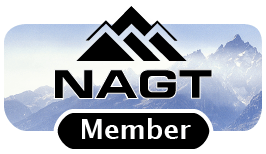 Introduction to Petrography -- John Butler, University of Houston; on-line course materials for igneous, sedimentary and metamorphic petrography. Guided Discovery and Scoring Rubric for Petrographic Analysis of a Thin Section -- David Mogk, Montana State University; A guided discovery approach is used to "unpack" the methods and observations used by "master" petrographers in the petrographic analysis of a thin section. A series of spread sheets are used to direct students to make appropriate observations to systematically a) identify minerals in thin section, b) describe rock textures to interpret petrogenetic processes and geologic history, and c) apply this information to address questions of geologic significance. The matrix can be used as a scoring rubric to determine the degree to which students have correctly identified minerals in thin section and described and interpreted rock textures. The Open University's Virtual Microscope - The Virtual Microscope is a development project at The Open University between the Multimedia Enabling Technologies Group and the Department of Earth Sciences. 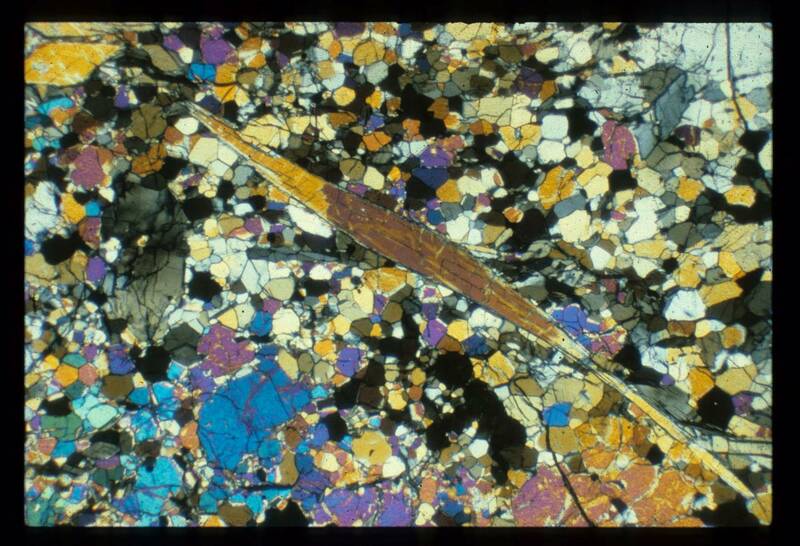 Choose a thin section to display and click on the controls to change the view. 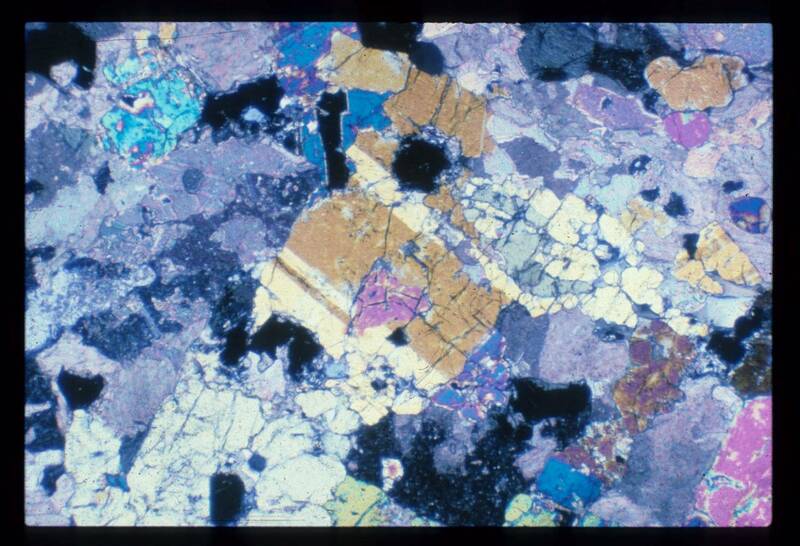 Microscopy and Mineral Images -- J.M. 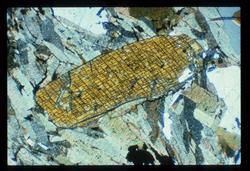 deRochette; rocks in thin section, stereoscopy. The Polarized Light Microscope: Should we Teach the use of a 19th Century Instrument in the 21st Century? -- Mickey Gunter, Jour Geoscience Education, 2004, v 52, p. 34. 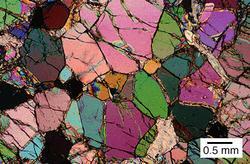 Optical Mineralogy in a Modern Earth Sciences Curriculum -- Jurgen Reinhardt, Jour. Geoscience Education, 2004, v 52 p. 68. A Strategy for Teaching an Effective Undergraduate Mineralogy Course -- R. Jeffrey Swope, Reto Giere, Jour. Geoscience Education, 2004, v. 52, p. 15. Submitted with the intent of posting at SERC. Resource submitted for posting at SERC. Resource was submitted for posting at SERC.